FuturePMO is owned, managed and staffed by WellingtonePPM. We are a leading Project & Portfolio Management (PPM) consultancy, working with clients across the UK and internationally with offices in Windsor, United Kingdom, Dublin, Ireland and Madrid, Spain. Our goal is to enable our clients to make a step change in their PPM maturity. We do this through a full turnkey range of services; from consultancy to training, technical deployment through to project delivery. 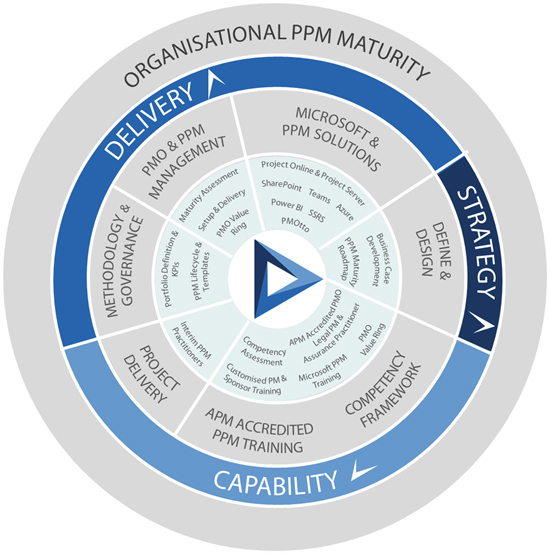 Uniquely we are the only organisation that is both a Microsoft Gold Partner with the PPM Specialisation as well as an APM Accredited Training Provider. We are also an exclusive Partner of the PMO Global Alliance and PMO Value Ring. Our clients range from global organisations to SMEs across most verticals.